The affordable, acclaimed AudioFX Headset incorporates a unique force feedback feature into a high quality full-ear headphone design and a microphone for gamers with superior voice recognition and noise cancellation,	making it an excellent high value gaming headset. Crystal clear stereo sound and so much more! The E-D Audio FX headset is a high quality full-ear unit with a microphone certified for superior voice recognition and noise cancellation. That's just the beginning. Bass-boosting force feedback built right into the headset gives you the complete immersive experience. The Audio FX reproduces sound effects to give a sense of three-dimensional space, actually improving your game play! Literally feel your enemy's footsteps approaching and intensifying or the rumble of engines and explosions with powerful amplified bass vibrations. A special feature of the AudioFX utilizes positional audio, meaning explosions to your right will feel amplified to your right side compared to your left side. Situational awareness is dramatically improved, just read what Techworthy.com/PC Upgrade Magazine had to say: "... the AudioFX Force Feedback offers an innate ability to generate a full environment of peripheral sounds, generating situational awareness as well as crisp, direct sound. That can be an invaluable tool in any game, particularly if some flunkie/zombie/unicorn/linebacker is ready to jump you from behind; you'll hear him coming thanks to the AudioFX." HLFallout.net says, "One of the first things I noticed after joining a Counter-Strike: Source game was my newfound ability to track people through walls and objects by legitimate means." Keep in mind that although you may acquire these new skills, using the AudioFX is not cheating. The human ear cannot hear anything below 20-25Hz but other frequencies can be "felt" as vibrations. If you've ever watched movies on a powerful home theater system then you know that bass is often times more a "feeling" than a "hearing" sensation. The Audio FX's bass amplifier interprets frequencies below 20Hz and transforms them into vibrations that we can feel through the headphone earpiece. Advanced transducers located in the earpieces convert these low frequencies into real vibrations to be felt for the most realistic and immersive sound experience ever. Get the home theater experience without waking up the neighborhood. Enjoy PC gaming, music and movies with home theater quality sound and bass, all in your own private listening environment! The AudioFX vibrations do not cause any discomfort or shake your head in any way. You have to experience it for yourself. Once you try the AudioFX, it will be your favorite gaming headset, we guarantee it! The plush cushioning ensures ultimate comfort for hours at a time. As a bonus feature, the Audio FX has LED level meters that light up on either side so everyone nearby knows that high intensity gaming is taking place. Perfect for showing off at LAN events, it's like a custom mod in a headset! The Audio FX is plug & play, connects to any PC and requires no batteries. The unit is fully size-adjustable and fits any head. The in-line controller lets you adjust both volume and vibration with ease. 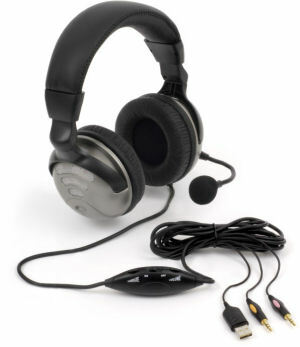 The flexible noise-cancelling microphone is laboratory tested for speech transmission and works perfectly with online chat programs including Teamspeak, Ventrillo, Roger Wilco, plus Skype or other VOIP chat. Requires one USB port for lights and force feedback and is plug and play. Compatible with any Windows PC. Warranty: Discontinued Product. No Warranty Available.